In a Nutshell: Tracing its roots almost as far back as when Texas became a state, Frost Bank has stood the test of time as one of the Lone Star State’s most reputable banks. However, it’s not all in the past for Frost Bank, which prioritizes customer relationships so much that it continues to open new branches to meet clients where they are. This extends to technological innovation, and Frost Bank is doing its part to serve customers with online and mobile services for those who prefer to bank that way. Frost Bank provides the same personal and business services as the largest national chains, but with a Texas-sized serving of authentic customer dedication. Frost Bank has a past older and more storied than most American financial institutions. In 1868, a lawyer and former Texas Ranger named Thomas Claiborne “T.C.” Frost came to San Antonio to help resuscitate his brother’s failing mercantile and auctioneering enterprise. Frost began helping local farmers and trappers warehouse their goods at his mercantile store until commodity prices rose. “If there was a big harvest and everybody had the same goods at the same time, the prices would be so low, and you wouldn’t get the best price,” said Bill Day, Vice President of Corporate Communications for Frost Bank. “Farmers and trappers could warehouse their items, and Mr. Frost would hold them until the prices went up. Frost Bank only operates in Texas, but its offerings and services rival any national bank. 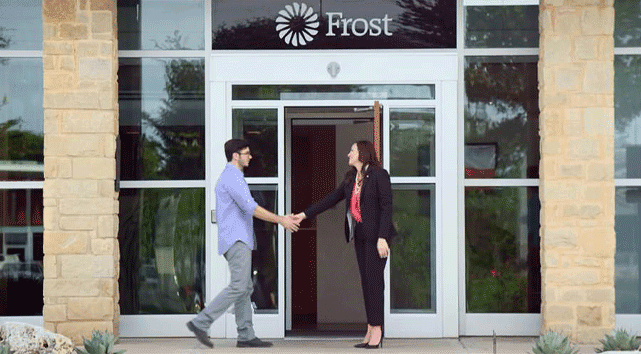 Frost, which recently expanded to 135 branches and counting, continues to grow in a current financial climate that has seen many national banks closing branches and downsizing. “It’s really exciting to be part of a bank that’s growing and expanding into new areas and adding branches,” said Bill. Operating as a regional bank in only one state for nearly 150 years, Frost has truly found its niche in Texas. The relationship that Mr. Frost established with his customers in the late 1800s has served as the bedrock for what Frost Bank would come to be known for most — unique, personable customer service. On a surface level, what Frost Bank provides doesn’t seem to be much different than other financial institutions around the world. But the Frost Bank difference lies in the relationships it forges with its customers. And — make no mistake — exceptional customer service isn’t just marketing speak: it’s a time-tested, fundamental part of Frost’s makeup. We’ve all experienced the frustration of calling a bank (or cell phone provider, family physician, insurance company, child’s school, etc.) because you need information, only to be met with a sterile, automated voice providing a list of options and the corresponding button to press. Sometimes you may get the information you need relatively quickly. And sometimes that information may actually come from a human being. But not before you’re first made to jump through hoops. One of Frost’s most popular traits is that there is always a human being on the other end, who picks up when a customer calls. No menus, no automated voice. An actual human being picks up the phone. Now, that may not seem like much on the surface, but it means the world to Frost Bank customers. “Where other banks meet you with an automated phone system or have you press 1 or 2, or even worse, make you say whether you want information on loans or accounts, you’re actually going to talk to a real person at Frost,” Bill said. “And that’s something we’ve become known for. If one of our customers ever has a question anytime day or night, they can call up, and an actual person at an actual Frost location will answer their questions. Though Frost’s roots reach back to the late 19th century, its practices and offerings are consistently forward-looking. As Bill noted, Frost provides every service and customer offering that the largest national branches do online and through mobile applications. Customers can even open accounts and apply for loans using the Frost Bank website. More and more people do their banking via mobile apps these days. For the past five years, the number of people using mobile bank apps has doubled. Our smartphones are always with us, so it stands to reason that banking customers would take advantage of the ease and convenience of being able to transfer funds, check balances, or chat with a representative anytime, anywhere. Most people are familiar with banking apps by now, but mobile wallets are just beginning to gain traction. Essentially, a mobile wallet is a way to carry your credit card or debit card information digitally on your phone rather than carrying the actual, physical card with you. Bill explains that Frost’s adoption of a digital wallet program is just one more way in which it’s satisfying customers demand. Since the Great Recession of 2008, many consumers have opted to leave global financial institutions behind in favor of doing business with smaller regional banks, a trend that has been a boon to the Frost Bank brand. 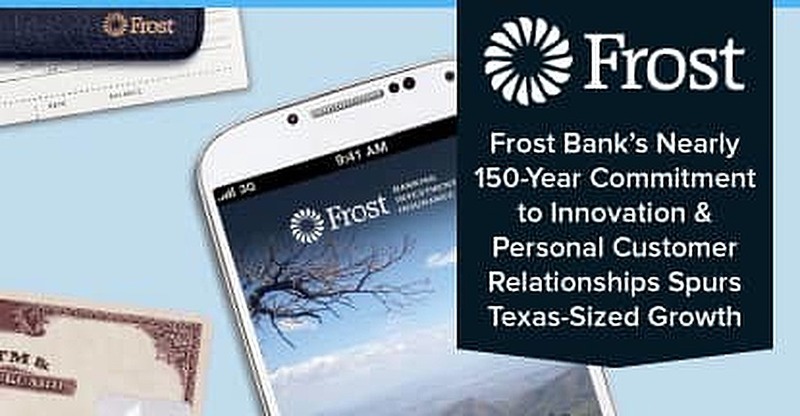 Frost is now one of the 50 largest US banks and the largest Texas-based banking company, with more than 4,000 employees statewide. It has doubled in asset size to $30.5 billion in the past eight years and has a track record of enduring innumerable nationwide financial calamities. Frost Bank customers trust the Texas-based regional chain for its commitment to service. With a long history of providing attentive customer service and handling the ebbs and flows of the banking industry, Frost Bank has proven its resilience in the market. Sean Garrity is a contributing editor at Digital Brands with over 10 years of experience researching, writing, and editing for numerous industry-specific publications. His goal is to help inform stakeholders about the latest trends and technologies in the finance industry. When he isn’t wrapped up reading about the latest solutions for consumers, you can find Sean outdoors, camping and fishing with his wife and two sons.